Today a mod that will delight those who make Pixel Art in Minecraft, as it will save a lot of work with this mod. Printer Block 1.7.2 and 1.7.10 allows first, create a block called “Printer Block” which is the basic element of the mod. Once we put this new block on the floor and we make left click , we will change the direction of the arrow to indicate the direction where the drawing will be printed, at the left or the right side of its block. The other option for this block appears when you make right click on it, and we see a new interface where we can make our drawings much faster and easier. You just have to choose the options in this “editor” and once we have our drawing done, click on “Print” to bring into our world. How to install Printer Block Mod for Minecraft 1.7.2 and 1.7.10? 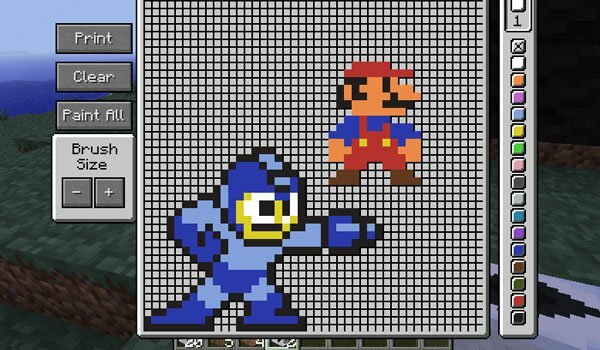 Your Pixel Art in Minecraft, quickly and easily!